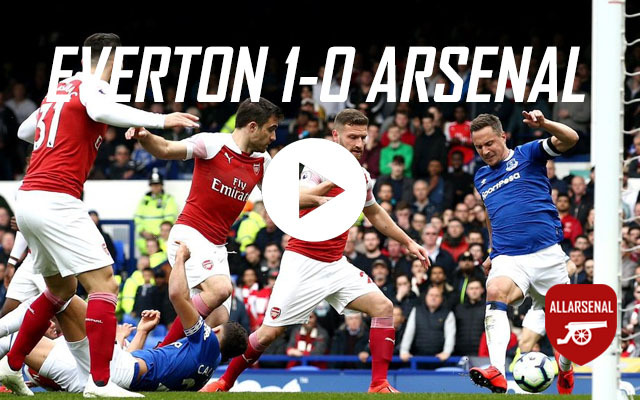 Arsenal missed the chance to go third in the Premier League as they lost 1-0 to Everton at Goodison Park. This was a key match for Arsenal in their hunt for Champions League qualification, knowing they’d go third with a win. They started with intensity and Alexandre Lacazette very nearly grabbed a goal inside five minutes but the Gunners missed the chance and follow-up. Everton made no such mistake when their chance came just a few minutes later as Phil Jagielka reacted quickest to score. Replays showed that the long throw which led to the goal was taken on the pitch and should have been penalised. Arsenal needed to respond but struggled in a lifeless first-half display. Unai Emery made some changes at the break but it was a case of more of the same. The Gunners started well but their influence waned as the match progressed. In a frantic second half, the home side had free reign down Arsenal’s flanks to attack and probably should have added a couple of goals. That didn’t happen but neither did a threat at the other end as Arsenal missed their chance to go third in what could be a costly afternoon.